A decision in 1916 by a committee of the Vassar Christian Association to found a Poughkeepsie community services center, Lincoln Center, under college auspices, sparked a philosophical debate between adherents to the former Vassar President Taylor and Taylor's successor and his wife. According to Josephine Palmer, the student founder of the center, Henry and Marjorie MacCracken's decision to support the center constituted a "radical change in attitude" from the Taylor administration, and prompted some members of the faculty to protest vehemently. Taylor's administration "felt that girls should remain behind the hedges and the stonewall and do their work and their studying, and let the work in the outside world wait until after graduation." The initial plan for a day-care center went forward in spite of the objections, and the committee chose for its location a rented room at the corner of Church and Jefferson Streets. The Christian Association funded the center until 1918, when Professor Laura J. Wylie, assuming leadership of the committee, transformed the center into a venture shared between the college and the town. Mrs. MacCracken succeeded Wylie and in 1920 obtained permission from the Poughkeepsie Board of Alderman to move Lincoln Center to a dilapidated building on the former Riverview Military Academy campus on Lincoln Avenue. Settling into the new site demonstrated the center's community support. Volunteers from local unions restored the building, the Zonta Club donated a small pool, the Board of Education donated playground equipment, and the American Legion and Veterans of Foreign Wars built playing fields--on one of which rests a small stone memorial of World War I. Poughkeepsie industries provided a wood-working shop, office equipment, bleachers, and lockers. In 1936 the Works Progress Administration employed a number of workmen to build a gymnasium. 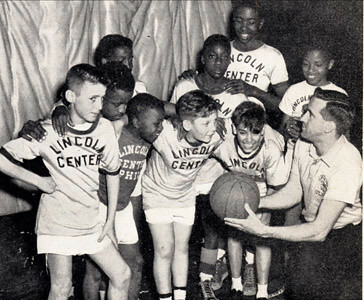 Activities at the Lincoln Center included a band, a basketball team, a baseball team, a "Week-Day School of Religion" program, the day-care center, a "Well-baby Clinic" conducted by the Board of Health, and classes in woodworking, cooking, sewing, handicraft, dancing, dramatics, basketry, hygiene, civics, weaving, carpentry, archery, household repairs and dramatics. 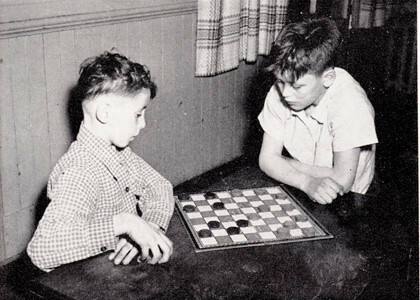 The center itself included a basketball court, baths, dressing rooms, and club rooms for both boys' and girls' clubs. The Self-Government Council, responsible for enforcing rules at the center, provided its young participants with the opportunity to familiarize themselves with the responsibilities of leadership, and lawyers, judges, and businessmen from Poughkeepsie volunteered to teach legal procedure and public speaking. 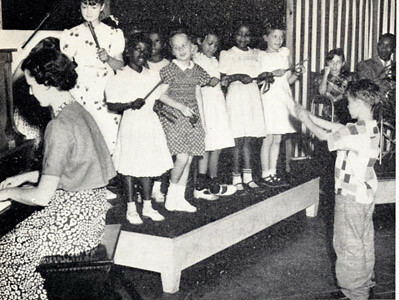 Although originally intended to serve Poughkeepsie’s youth, the 1950’s organizations for older citizens, such as the Gay Nineties musical group, were formed at the center. Lincoln Center was good for the community. A study conducted in the 1930’s by Vassar professor Joseph K. Folsom showed that boys who lived in the district where Lincoln Center was located were half as likely to engage in delinquent behavior as boys living in other Poughkeepsie districts, and Marjorie MacCracken wrote of Lincoln Center that "Those who know Poughkeepsie best believe in its work as a bulwark against delinquency, as an instrument of better racial understanding, and as a pioneer in work for the aging." The center benefited Vassar students as much as it did the Poughkeepsie community. The day-care center remained a branch of the Vassar department of child study where, according to President MacCracken, students received "valuable supplementary training to that given in the Mildred R. Wimpfheimer Nursery School," which prepared them for "the conditions that will be encountered by Vassar graduates in this field in many of the social centers throughout the country." 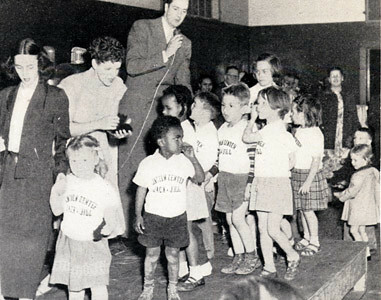 By 1938 between 60 and 70 Vassar volunteers visited the center every week to direct clubs, teach classes, help in the Nursery School, fill Christmas stockings, donate their old clothes to poor families, and raise money to contribute to the annual budget. Lincoln Center disbanded in 1961, and the Neighborhood Service Organization took over its activities. Arson destroyed the Center in March, 1979, but the NSO was able to continue its activities and services uninterrupted at replacement facilities. Vassar’s tradition of social service continues today: many students volunteer through Vassar Volunteers, a student organization, or as Community Fellows, under the joint direction of the Office of Religious and Spiritual Life and the Campus Employment Office, and others work for community agencies through the Field Work Office. The Vassar community as a whole engages with the greater community through the annual Community Works program. Josephine Palmer, '17, Interview by Elizabeth Daniels, 13 April, 1982, Vassar College Special Collections (VCSC). Marjorie D. MacCracken, "Forty Years at Lincoln Center," Vassar Alumnae Magazine (June 1957) in Lincoln Center Subject File 1.59, VCSC. "Annual Report of Lincoln Center, 1929-30" and "This is Our Story" both in Lincoln Center Subject File, 1.59, VCSC. Henry Noble MacCracken, "Vassar’s Social Laboratory," Vassar Alumnae Magazine (March 1941), Lincoln Center Subject File 1.59, VCSC. Poughkeepsie Journal April 4, 1979; "Lincoln Center to Re-open," Poughkeepsie Journal, March 12 1974.